Hong Kong at night. Photography by Nathaniel Parker. Whether it’s hard-drinking writers like Capote, Kerouac, and Cheever, over-caffeinated creatives like Bach, Beethoven, and Balzac, or drug-addled rockers like Janis Joplin, Jim Morrison, and Kurt Cobain, the figure of the intoxicated artist remains a powerful motif in the mythology of the creative class. Now, we could debate if the taste for mind-altering substances among high-achieving creatives is a cause or effect of their chosen line of work. We could also plumb the academic research to see if a scientific basis for connecting substance intake with increased idea formation is borne out by the data. Or we could reframe the whole concept of psychologically-induced creative heights by heeding a recent study that found that professional stock traders working on high floors in skyscrapers take greater risks in their work than those toiling on lower stories. Eiffel Tower, Paris. Photography via Pixabay. What, you might ask, has stock trading to do with creativity? Plenty. For starters, both stock trading and creativity involve unpredictable outcomes. No trader on Earth can predict with certainty that a particular stock price will rise in the future; whatever money gets invested in the market is therefore vulnerable to loss. The pitfalls of uncertain consequences can prove especially damaging for those who dare to break strongly with convention. The engineer Gustav Eiffel was severely attacked when he proposed the iron-latticed tower that bears his name for the masonry environs of the low-rise city of Paris. Van Gogh barely sold any paintings in his lifetime. Copernicus’ theory of a heliocentric universe was not a big hit when he first floated it. Trading and creativity share a second characteristic intrinsic to risky ventures: they both involve high stakes. For the trader, there’s the perpetual prospect of financial ruin. For the creative, it’s a lingering threat of failure and everything that comes in its wake: diminished self-esteem and motivation, loss of reputation, reduced income or access to opportunity, ridicule, and social condemnation. Seattle Space Needle. Photography by Stephan Jola via Unsplash. Okay, so stock trading and creativity share the element of risk. Are we therefore to infer from this new study that we creatives could up our game by perching ourselves above the ground plane? As a matter of fact, yes. What’s more, we’ve had evidence hinting at this effect for quite some time now. Back in 2007, for instance, two scientists from the University of British Columbia ran in experiment in which it was discovered that people are more adept at solving creative problems while working under a ten-foot ceiling than under an eight-foot one. Subsequent research showed similar results when people are given access to views, exposed to the color blue, look at memorabilia, or dress more formally. Mona Lisa (La Gioconda) by Leonardo da Vinci. c1503–06. Digital reconstruction after copy of original painted by Francesco Melzi(?). From the book Your Creative Haven by Donald M. Rattner (Skyhorse Publishing, 2019). The common thread among these conditions is the element of distance. In the cases of ceiling height and views, it is distance in its literal meaning of physical dimension. With blue, it’s the allusion to depth rather than actual feet and inches, blue surfaces conveying the illusion of receding from the eye (a naturally occuring optical phenomenon Leonardo exploited to depict a distant landscape in the upper third of the Mona Lisa). The nostalgic contemplation of artifacts from the past similarly instills a sense of distance in our minds, only now in the currency of time rather than in the metrics of space. As for dress, scientists theorize that donning relatively formal clothes (think three-piece business suit versus cut-offs and a tank top) induce a psychological effect in both wearer and observer called social distancing. According to this theory, the more formal the clothing we wear, the more apart we perceive ourselves to be from others, and them from us. Conversely, the more casual our attire, the more approachable and less distant we appear. Very interesting. But how does the intuition of distance, however it might be implanted in our minds, tie into risk-taking and creativity? TOP: The view from the top of the Ferris Wheel. The dark blips on the ground are called “dots” by the Orson Welles character in the film. BOTTOM: At ground level, Joseph Cotten is easily identified at close proximity. Photographic stills from the 1949 film The Third Man, directed by Sir Carol Reed. The famous Ferris wheel scene from the film The Third Man could provide the answer. 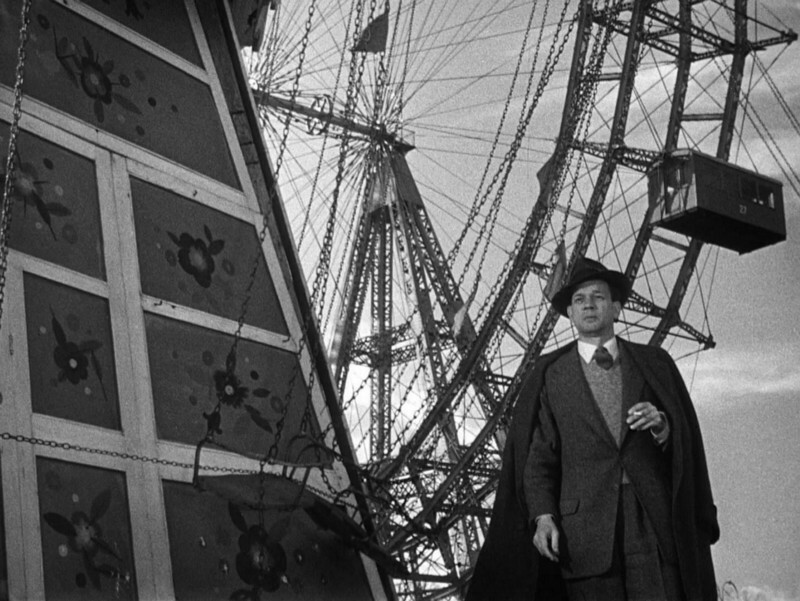 The scene has Orson Welles and Joseph Cotten riding a giant wheel in an amusement park in post-War Vienna. They’re high above the ground when Welles points down to a scattering of fairgoers below. The character questions whether Cotten would honestly feel sympathy if any of the “dots” moving on the ground were to die. In other words, for Welles, people aren’t sentient, living beings, but abstractions. The problem is that the Welles character literally believes this, treating the victims of his criminal schemes as no more than “dots” in his pursuit of financial gain. The Welles character is right about one thing, though: objects viewed from a distant vantage point necessarily morph into abstractions, since the eye can no longer make out small-scale detail or texture. It’s also true that seeing things from far away implies that the observer has a big-picture perspective, because the farther back we are from the object of our attention, the wider the physical expanse captured by our cone of vision. Here’s where creativity, high-risk stock trading, elevated vantage points, and distance begin to intersect. Point one: Our brains are susceptible to shifts in cognitive style depending on the inputs entering our consciousness through the five senses, a triggering effect known as brain priming. Point two: Primes that cue intimations of distance, whether physical, social, or temporal, lead us to think more abstractly, i.e., in a big picture mode, because of the association our brains have forged between physical distance and its optical effects. Point three: Creative thinking is by nature abstract and big-picture; primes that cue perceptions of distance therefore stimulate creative thinking. Point four: To be creative necessitates maintaining an open mind, exploring boundaries, and tolerating risk. Point five: Stock trading entails varying levels of hazard depending on the trader’s appetite for risk. Point six: Traders are more likely to exhibit explorative, open-minded, and risk-tolerant behavior when primed by the optics of distance and expansiveness than traders cued by intimations of proximity and spatial containment. Point seven: Comparatively speaking, people generally will be more adept at finding creative solutions to problems when positioned high above the ground plane than when they are close to it. A recently completed apartment building at 432 Park Avenue in New York. Design by Rafael Viñoly, Architect. Photograph by Yonghyun Lee via Unsplash. This is undoubtedly welcome information for all you creatives who currently reside or work on the upper stories of high-rise apartment buildings and office towers. Orient your creative workspace so you have a view to the outdoors. Sure, long vistas from a hundred stories above the Earth are to die for, but almost any exposure to the exterior will alleviate the sense of confinement that often stems from being indoors. Hang the right kind of artwork. Research shows that our brains will respond to two-dimensional and metaphorical representations of distance as well as to its literal manifestation. When selecting artwork for your or your organization’s creative space, look for landscapes, travel posters, urban views, old photographs, and other subjects evocative of spatial or temporal distance. Dress up, not down. Home-based creatives would do well to avoid the temptation of lingering all day in their pajamas. Workers in retail and office environments rarely have that option to begin with; instead, consider dressing a step above your colleagues as a means of honing your creative edge. Home office and library. New Vernon, New Jersey. Architecture by Dubinett Architects. Interior design by Jane Connell of Fun House Furnishings & Design. Photography by Laura Moss. From the book Your Creative Haven by Donald M. Rattner (Skyhorse Publishing, 2019). Go blue. Decorate your space wholly or partially in a blue palette, using neutrals and natural finishes to provide visual relief. Or, if you‘re among the population that spends a good part of the day gazing at a computer screen, set your desktop and background colors to blue for continuous priming. Find yourself a space with a high ceiling. According to the data, we’re at our creative best when we operate in spaces at least ten feet high. Stuck with standard eight- or nine-foot ceilings? Try tricking the eye into thinking otherwise by installing vertically striped wallpapers, tall mirrors angled slightly toward the ceiling, and decorative wall displays that lead the eye in an upward direction. Disclaimer: The above recommendations are intended for enhancing creative task performance among a general population. Do not attempt to apply them to high-risk stock trading unless you are a licensed and trained professional!